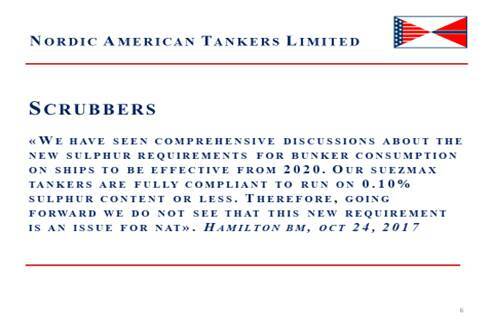 Nordic American Tankers Ltd (NYSE: NAT or the “Company”) communicated its view on the new Sulphur requirements, effective from 2020 in our Press Release October 24, 2017 and in a NAT conference call held February 20, 2019. The Company is steadfast on its decision that scrubbers are not a solution for NAT based upon a conservative financial policy. NAT does not take on risk it does not have to. Now comes the news that several ports consider banning scrubbers. The point of the scrubbers is that they clean the exhaust from the ships for sulphur. The consequence is that the ships pump impure water into the sea – and that is what the ports will now put an end to, writes Reuters.